Do you have a testimonial to share? Please send us your comments! "Received my spoons and I am delighted. Thank You for the baby spoons. They are precious. You have excellent taste. I will be returning to shop for more goodies." - N.B. "This is a long overdue thank you to Mary and The Sterling Shop for the incredible help you gave to me as I put together several dining scenes for a motion picture set in 1858. Mary went above and beyond to provide the correct historical items. Her knowledge and diligence are invaluable! Thank you!" - L.P.
"I received my 12 place settings of Community flatware by Oneida yesterday and love them!" - M.N. "The kids received their gift Tuesday and were very happy. Thank you for your wonderful, efficient customer service!! You were so efficient!! I certainly appreciated your work." - L.B. "My spoons arrived this morning, they are beautiful. Thank you so much for all your help. I will keep checking back to see if there is anything else that I need or just plain want." - A.V. "I received the Wallace Marquise sterling ornament today - it is beautiful! Your website and your service are excellent. I am a returning customer, and frequently visit your site... thanks again!" - J.A. "The pieces that you sent me today are perfect! I cannot thank you enough for these beautiful pieces. I have decided to keep the few pieces from my parents that are damaged (for sentimental reasons), but now I have a complete set that is in excellent condition thanks to you. I will look over your website very soon and decide what I want to purchase next." - L.G. "I just got in my sterling spoon and tray, I love it, perfect... fits just right under my vinegar and oil servers... Wow, I am so pleased - will order much more soon. Thanks so much." - D.M. "Thank you!!! I absolutely love the tray - it is more beautiful than it appeared in the picture. Also, I appreciated the careful packaging. I look forward to purchasing more from The Sterling Shop!" - R.S. "You are FABULOUS! The order arrived today, sooner than expected, and the items are beautiful. I'll be watching your website to add pieces later on. Thank you so much!" - M.M. "The sterling order arrived yesterday and it is perfect! I am very pleased with the sterling and have shared your website with my family. Thank you and you'll be hearing from me again." - T.Z. "Thank you for the great packing job! I love my things. As always, I am so pleased with my order. Thank you!!!" - M.C. "I just received my silverware setting for eight and it is perfect. It matches the set I have now. I am very pleased with it and your service, thank you so much!" - R.C. "I received our silver and we are very happy to complete our set and with the condition, thank you." - S.D. "We received the order of pearl handled forks this weekend. They were just what she wanted! She was very, very pleased with the order and looks forward to doing business with you again! Thank you so much for your sincere honesty and attentiveness. Sometimes, when you order things over the phone, you don't always get honest people. So again, we thank you." - T.B. "Beautifully packed, quickly shipped, and of a quality that surpassed my expectations; great value!" "I trust this email finds you and your family well. The silverware arrived today. All of the pieces are beautiful and in excellent condition. The Edgewood pattern is stunning like the Charter Oak so I am going to be on the hunt for some pieces in that pattern, a girl can never have enough silver patterns can they? Thank you for taking the time with both my sister and myself and choosing pieces of silver of excellent quality. Take care and we both have your Sterling Store in our favorites so we can check often to see your new stock in these two pattern." - L.K. "I received my Young Love by Onieda silverware. It is lovely. It was such a pleasure to deal with you. Thanks again for all your help." - O.A. "I love the new ice tongs. Thanks for your help in selecting them, and for your great service in packing and getting them to me. I will enjoy using them." - L.S. "Your package arrived today. Each piece is magnificent. No marks at all. I will enjoy the boost in my set for many years. Thank you. "- W.H. "Thank you so much for your fast service. The Spanish Crown Community fork was in excellent condition and now my set is complete." - C.Q. "My order has been received and is beautiful. Hopefully, I can do business with you again in the future." - P.S. "My tomato server and pickle fork just arrived! They are beautiful and came through customs without charge!. Thanks for a very positive experience!" - J.F. "The silver pieces arrived yesterday. They are in perfect condition. I appreciate all of your assistance and will be sure to contact you again when I need to add or replace a piece. Thank You." - S.Z. "I just received my Sir Christopher sterling flatware. It is lovely beyond my expectations; the pictures did not give it the praise it deserves. I am amazed at the polishing you did for all 115 pieces and wrapping of each piece for safe travel across the country; it was a service I was not expecting. 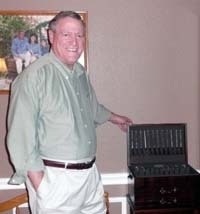 From our very first conversation, I was impressed with your knowledge and expertise of this antique silver set. I am glad to know a little of its background and I will treasure this set for as long as I own it. I cannot wait till Thanksgiving to set my table. Thank you again and I look forward to shopping with you in the future. It is always a bit of a worry when you are buying something of this value from a picture online. However, I am completely satisfied with the silver, the service, the payment process, but most of all I am thankful for your attention to every detail." - M.G. "I received the butter knives in good order and am so happy to have them. They were in excellent condition, as advertised. Thanks." - B.J. "My pearl handle forks just arrived and they are beautiful. Thanks ever so much for calling me and talking about the forks. I'll be back to buy from you in the future, as your silver is first rate--just as you promise it will be. Thank you so much." - C.H. "My order was received, and in excellent condition. Thank you for enabling me to again have a full service for 12. This fork perfectly matches my set, which is also in excellent condition. Happy that I found you on the Internet." - K.B. "Just to let you know that EVERYTHING arrived in 'shining' perfection. Thank you so very much. The antique silver pieces as well as the jewelry are just lovely. My dinner party went off without a 'hitch' and the exquisite silver fruit bowl and serving spoon made the presentation of the dessert a lovely and elegant finale to the dinner menu." - J.B.
"The knives just arrived and they are lovely! I shall always bear you in mind if I am looking for silver. Thanks." - M.R. "The WONDERFUL set of La Scala Gorham silver arrived today in perfect condition. The service is exquisite! And thank you for taking so much care with the shipping. Your careful wrapping kept everything in place and there was not one single scratch. Thanks for your call. I really appreciate your customer service and highly recommend your beautiful silver. I'll be back for candlesticks in the future." - L.S. "I've purchased sterling from a couple of others lately, trying to complete my set. So I have other recent experiences to compare. By far, my experience with you and your products have been absolutely the best! To you it probably seems you are "just doing your job", but you do it so exceptionally well. I've come to trust your advice, to trust you will do what you say you will do and often even more, to trust that you are an expert and know what to do, and to trust in the quality of your products when they arrive. You do it all at a reasonable price as well. I think when a person and their business stand out in this way, it is well worth the effort to spread the word. You are very rare, but you probably don't realize it!" - D.C.
"I received my sterling forks and I couldn't be happier. Thanks for going above and beyond for me!" - G.K.
"I wanted to let you know how pleased we were with the Old French purchased from you for our wedding gift. The bride was ecstatic over receiving the pieces which were beautifully polished. Many thanks to you for arranging for the separate shipping to Virginia. I'll look forward to shopping with you again." - S.H. "I picked up the package at the post office today. Thank you for sending it by express mail. I am sure my sister and my mother will be so pleased with their butter knives. Thank you so much for all your help and for taking the extra time to help me find all these treasures. With my sincere thanks and blessings to you and your family." - J.M. "I wanted to let you know that the Thanksgiving surprise of the Dimension silverware set turned out wonderfully! Right before sitting down to lunch, my daughter and I quickly switched out my flatware for the Dimension silverware set before my husband came to the table. He carved the turkey and served everyone and then sat down in his chair and saw the silverware and literally could not speak. He just kept shaking his head as tears welled up in his eyes. I quickly gave him a book I had put together with a photo of his parents and a note explaining that although this was not the original set they had given him long ago - that I thought they'd be pleased we were sharing an identical set. We are still absolutely astounded that the set was in such perfect condition with most of it having been in the original wrappers. I truly feel that this was meant to be. Thanksgiving evening he put every piece in the chest - yes, out of the wrappers and ready to be used for many family gatherings. THANK YOU, THANK YOU, THANK YOU for all of your nice responses to my emails, taking the time to speak with me on the phone, for delivering everything packaged so nicely, for locating the additional serving pieces and for so accurately representing what you had available for purchase. I would highly recommend you and your business to anyone looking for silver pieces to add to their home. You helped me provide a priceless gift to a man I love so much - thank you." - B.R. "Thanks for your note. This is my mother's Christmas gift to me. After 20 years of marriage my silver set will be complete with 12 place settings! I am so happy to have found your shop online." - K.K. "I am so pleased that I discovered your shop. There other pieces that I wish to purchase later -- The Sterling Shop eliminates the search. I shall pass your site on to my friends." - G.F.
"Thanks so much for your prompt shipment of the beautiful Baroque silverplate bowl. It arrived today We are most pleased. Here's wishing you much success in your business in all the future that lies ahead of you." - N.G. "My mother purchased her first place settings of Prestige Gay Adventure in June 1955. She was unable to complete the 12 settings she wanted and had to settle for 10. I was so very happy to find the last two settings of every piece she had plus add a few extra serving pieces. The product was shipped on time, in perfect condition. Thank you for a wonderful experience with your company." - S.M. "I received the sterling gravy ladle promptly and safely packed. When I opened the package, I was astonished at the beauty and pristine condition of the vintage ladle (a gift for my gravy-loving husband on the occasion of our 25th wedding anniversary). I feel confident that The Sterling Shop will be of great help when I have to find something very special for my dear ones. Thank you!" - M.S. "Thank you so much for all the special care you took with these exceptionally beautiful pieces. The pierced tablespoon looks like new, but with the pattern oxidation intact. PERFECT! Actually every piece is perfect, but I didn't expect the tablespoon to be so special. You have truly exceeded my expectations! You and your business are truly exceptional in this day and age! Better than Nordstrom! :-))" - D.C.
"The silver arrived today. It is just beautiful! My husband said he likes it better than ours. Thanks for all your help." - C.O. "I have to write to tell you how impressed I am with your service. My order got here so fast I am amazed! I purchase online often and I think you have given me the best service EVER. I can't wait for Thanksgiving and laying them out for my guests. With service and quality like this ordering from anywhere else is unthinkable." - R.C. "The wonderful sterling and tortoise shell hairpin arrived today and I am extremely pleased! Thank you so much." - L.A.
"I have received my order and everything is perfect. I would like to thank you for your courtesy and promptness in shipping." - S.S.
"The order arrived safely yesterday, and everything is perfect. I would like to take this opportunity to thank you for your terrific assistance!" - Z.M. "The Milburn Rose sterling arrived safely yesterday afternoon. I am thrilled with it and have already used it last night! I can certainly see and feel the difference in the older Westmoreland. Thanks so very much for sharing your knowledge, the beautiful sterling and for the "sterling" customer service as well. My shopping cart on your site already has items in it for next time!" - B.K. "Today I received the cream pitcher, sugar bowl, and tray in the Rose pattern by Stieff. It is wonderful.... I am so pleased. The monogram is beautiful and the pattern Rose is even prettier than it looked in the picture. The sterling Berry Forks in Towle's Old English pattern were better than I expected. I have been so happy with all my purchases from your shop. Thank you for the great packing as well." - M.C. "Your new web site is so much easier to use and a big improvement. It makes it easier to shop. Thank you!" - G.J. "I plan to finish off my mother's silver later this year. Of course I'll be getting it from you." - I.S. "Your customer service - both on the phone and online - is exemplary. The owner ROCKS. I have enjoyed adding pieces to my long-discontinued pattern." - A.N. "EXCELLENT service with a personal touch." - N.S. "Customer service is fantastic, very quick to respond and wonderfully helpful." - A.O. "I have received my sterling spoon. It is beautiful. How on earth do you get 50 year-old silver to look so beautiful? I didn't realize how dull and yellow mine all looks! Thank you!" - S.W. "I seldom buy silver, but when I did you were extremely helpful. It was also very good to be able to telephone and talk to a very knowledgeable person." - C.F. "The first set of sandwich tongs arrived today, and they are stunning - even better than the picture. Many thanks." - C.Y. "Thank you so much! Our sterling soup spoons and butter spreaders arrived yesterday. We're delighted to have complete place settings now for 10! Will work toward 12 in the near future." - J.B.
"Excellent experience shopping with you." - K.O. "Just wanted to drop you a line about my order. It came yesterday in the mail. I opened up the box and counted the items and checked everything. It was all there, it was in GREAT condition. Everything was so good. Thank you for providing this service and product!" - D.H.
"You are just great. You provide excellent service, you are very friendly, kind, I trust you, and I will always buy from you. Thank you for being there." - N.S. "The silver arrived today, it is perfect . If I have a need in the future for any replacements I will certainly place my order with your company. Thank you!" - V.G. "You have the best quality and best prices; even better than Replacements (discounted items), Ruby Lane, and Go Antiques." - C.M. "I received the silver today, and it's just PERFECT! Thanks so much for all your extra help in finding the iced tea spoon. My friend will be thrilled. Thanks again, and hope to deal with you again!" - K.L. "Fair and fast shipping and the very nicest service. My pattern is so old, its hard to find pieces, but when you have them, I would always buy from you." - S.L. "I am so happy with my purchase and even happier with the customer service. I will certainly recommend you to my friends." - M.B. "Just got back from a short trip to find the Lunt Mount Vernon soup spoon. Thanks so much for the speedy delivery and the incredible packaging. Will be back to shop more with you!" - M.E. "I have been very happy with all purchases and you ship much faster than Replacements." - T.A. "It is beautiful. Thank you for the silver box also. Now, I will put my own silver in it to give to my son for his wedding gift. I have already put the new in my china closet. I am so excited. New silver after 43 years of marriage. Thank you again for all your help." - B.Z. "We buy the Gorham snowflake every year from you and have been extremely pleased with the excellent service." - T.T. I" received the spoons today and am VERY happy with them!" - R.P. "Delighted to find very rare silverplate flatware on your site. Even more delighted with the nearly new condition of the items! - P.S. "I LOVE the Lily Bowl- I have it displayed in my dining room. I just walk by it constantly admiring how beautiful it is. My problem is I keep seeing silver on your website that I am lusting to own. Some ice cream spoons are next on my list, but need to wait a bit. I love looking and reading about all the silver you have. Thanks." - M.C. "I was very impressed with your customer service! Thanks." - L.C. "We got the forks and they are fantastic! Thank you so much. It was great to do business again together." - S.Z. "Super fast response and delivery of my order, thank you." - L.W. "I received the baby spoon and fork yesterday, and I am thrilled beyond words. Thank you so very much! I'll be checking your website and hopefully I'll be in touch with you again in the future." - S.E. "Thanks so much, what a sterling job! The Towle Old Lace pieces I ordered from you this week arrived yesterday and I am very pleased with all of them. I'll continue to check your website in case anything new appears that might be nice to add to my set. All the best." - D.C.
"The knives arrived yesterday; they are beautiful. Thank you." K.K. "The lovely master salt spoon arrived yesterday and it is perfect." - K.D. "I enjoy your web site. It is very well done and so easy to navigate. I do a lot of online shopping for silver and am delighted to have found a place that I can trust the pieces to be as presented. Your silver has always been of wonderful quality." - M.C. "Thank you for this marvelous personalized service. I can see why you have been in business so long." - D.A. "Truly excellent customer care and service!" - R.W. "Silver arrived and I am very pleased. Look forward to calling you again when I need some silver." - D.D. "This is my second purchase from your wonderful website! I love the sterling and the silverplate that I purchased in October. All the pieces were in excellent condition and shipped quickly to my door! This time I needed help deciding which pattern would be the best choice for my mother-in-law. You did an excellent job steering me to patterns that are perfect for her. Thank you for your quick responses and for you assistance. You will be my first choice when it comes to purchasing silver! Thank you! I couldn't be more pleased!" - D.W.
"I meant to email earlier in the week to tell you my order (Silver Lace) got here and it's great. I used it last night with my gal pals and they all gave me a hard time for never having seen it before. All bright and shiny - it looked really nice. Thanks for helping me with the order." - B.W. "The two pieces of sterling just arrived yesterday afternoon, right on time. As I had hoped after talking with you, they are both really beautiful. I can't thank you enough for all the time you took on the phone helping me choose the items. It probably sounds silly, but working with you over the phone, I felt as though you were someone local that I had known for a long time. That's how friendly and helpful you were. We will be giving my son and daughter-in-law the gift tonight. You are absolutely wonderful! I look forward to doing business with you again. Thanks again." - S.F. "Your website is the nicest and friendliest of any I've searched through for silver. Really stellar." - P.W. "The coffee and tea set arrived today and I'm very, very pleased with it. Thank you for the excellent service, packing and speedy shipping!! I'll look forward to doing business with you again." - W.E. "Wow! Talk about service! Thank you so much! I have already told one friend about you and will pass along your fabulous web site! This is my birthday present from my husband and he is also thrilled! Thanks so much! I am so excited!!!" - D.W.
"The pieces arrived safely and are lovely. Thank you for your patience, simply superb customer service and very good pricing. Hope more is in my future..... Best wishes to you." - K.H. "The four Christmas Crosses arrived this afternoon in perfect condition. Thanks for everything!" - G.D.
"Thank you very much for the nice cake server, which arrived today in best condition. I love it. With my very best wishes and kindest regards." - I.K. "The Repousse candlesticks are beautiful. Thank you for your help and attention when I bought them. Having you describe them and provide additional information gave me great peace of mind when I ordered. Thanks also for sending them so quickly." - J.L. "I wanted to let you know how thrilled I was to receive the 12 place settings of Remembrance. Your customer service was amazing from the initial order to the final delivery. All the pieces were in excellent condition. I know that my daughter will enjoy this wedding present for many years. Thank you again for your personal touch. I hope to be in contact with you again." - B.H. "I felt completely confident shopping and buying from The Sterling Shop! There seems to be "something for everyone" at your site - from cleaning supplies to information to "top of the line" silverplate and sterling!! Educational AND enjoyable!" "Thank you for having this pattern, you are fulfilling a 50-year-old promise." - R.P. "My package arrived safe and sound. It's great. Thanks!" - V.K. "Two weeks ago I had my entire immediate family plus spouses together and for the first time we had enough of my silver pattern for everyone. I felt so special. It has been almost 36 years since we married and I have wanted to complete my set ever since. You made this possible this Fall. Thank you for your help." "Thanks so much for the beautiful sterling butter knife in my pattern "Old French". It is perfect and the monogram "G" is just fitting for our family. It arrived in just one or two days-even during this busy holiday season! Thank you again. I am informing my friends about your company." - M.G. "I was very happy with the knife I ordered and very happy to find the pattern as it belonged to my husbands grandmother." "I wanted you to know that the cocktail fork arrived Wednesday in excellent condition. Once again, thank you for your fine service." - R.S. "I had ordered 18 sets of a silver pattern and was so tickled to receive them in non-tarnished bags and a silver box also. The one I currently have would not have held the new ones also. Everything came timely and best of all, as advertised and in good condition! Thank you!" - L.C. "The silver arrived yesterday. It's beautiful. I love it. Thank you very much." - J.M. "Just wanted to drop you a quick line to let you know the tomato server and knives all arrived yesterday afternoon in good order. I'm absolutely thrilled with everything and thank you so much for being so wonderful to deal with. And thanks also for the xerox copies about the Wallace Floral pattern, . . . very informative. I'll be in touch. Thanks again." - D.D. "We just want to congratulate you on your professionalism and let you know that we are completely satisfied with our purchase from you folks. Your web page is a delight to use, extremely user friendly, complete and pleasing to the eye. The ordering procedure was, again, easy to use. We had one question about the length of one of the pieces and one of you, personally, answered our inquiry which helps the first time customer have faith in your company. The shipment was made immediately with no hang-ups, sent to the correct address and the entire transaction was handled by you in a most efficient and ethical manner. The six place settings were, as you had stated, in excellent condition and we are very pleased with our purchase from The Sterling Shop. If we were to need merchandise which you handle in the future, rest assured that we will shop your store first. "- M.B. "My spoons just arrived and they are beautiful. They look very new alongside my old ones, but I'm happy. Many thanks for your excellent service. I will certainly deal with you again and recommend you to others." - B.H. "I just wanted to let you know my silverware arrived today in lovely condition! Once we "break it in" at Thanksgiving this year, no one will ever know which was Grammy's and which was acquired." - B.J. "Thank you for sending the cake knife and server. I did not expect to receive them so soon! They look beautiful. You did such a nice job matching the finish. I know they will look beautiful at my daughter's wedding. Thank you again for sending them." - P.P. "Of everyone I've done business with, you are not only the nicest but the most informed. Thanks again for your help with the info about my pattern. Talk to you soon." - D.D. "I received the items you sent and they are wonderful! Thank you!!" - K.T. "Got the pieces I ordered...BEAUTIFUL! Thanks so much! Been great doing business with you!" - D.H.
"Just wanted you to know that I received the silver yesterday, and it is just beautiful. I am very happy with it. Look forward to making more purchases in future." - K.M. "It's BEAUTIFUL....Can't tell you what this means to me... So grateful for the care you took in getting it to me...I may order more from time to time...Thank you." - P.F. "Thank you so much for the prompt shipment. I will feel very proud to use my completed set of my mother's silver pattern this Christmas. My mom slowly collected her silverware in the mid fifties on her salary of seventy five cents an hour." - K.R. "I am thrilled to have added to my flatware. I am extremely pleased with the spoons. Thank you very much!" - S.B. "I am very happy with the contents of the shipment. The order was complete and in excellent condition. I still have some dessert forks to purchase and perhaps a few other odds and ends pieces." - L.W. "They arrived today and are beautiful! I am so happy to have them as I have my mother-in-law's Francis 1st sterling that she got when it first came out and it is engraved with her maiden name initials! Thank you!" - J.H. "The forks arrived today and they are WONDERFUL, I absolutely love them!!!!!!!!!!!!!!!!!!!!!!!!!!!!!!!!!!!!!" - R.B. "I just want to say thank you for all of your help. You are extremely knowledgeable about flatware and guided me in making a decision. I appreciate most of all your prompt follow-up if I had any questions and the flatware was even better than described when I received it. Thank you again for taking the time to assist me. I cannot say enough good things; I feel like I know you on a first name basis now. I look forward to selecting a few more pieces to go with what I bought." - L.S. "I received my order today and I am very pleased with your service. You're the BEST!!!" - A.C.
"My silver order arrived today, nicely packed and as described on your website. I am so excited to be able to present this to my daughter before her wedding in August. Thank you so much! You have been a pleasure to work with. I will return to you for my future silver purchases. God bless." - B.B. "The Affection silverplate flatware I ordered is beautiful. I am very pleased with the service as well as the merchandise. I will plan to shop with you again. Thanks." - B.H. "UPS delivered the 12 pearl handled spreaders to us at 9:20 am this morning. They are beautiful, and my wife absolutely loves them. The knives will grace the table at a dinner party we are hosting tonight - assuming that the guests can get here through the predicted ice and snow storm! Thank you so much for your assistance." - B.Z. Do you have a testimonial to share? Please send us your comments.